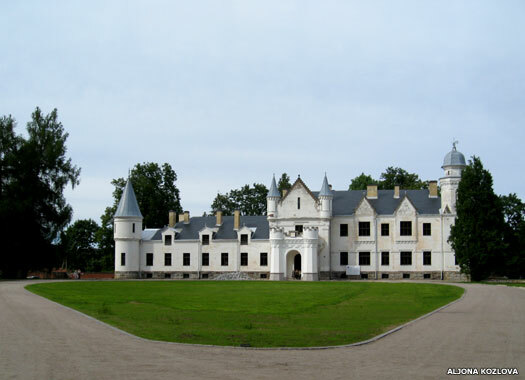 Alatskivi Manor (or mõis in Estonian) is classified as a castle. It lies in Kodavere Parish in Tartu County, in the south-east of Estonia near the shores of Lake Peipsi, which separates Estonia from Russia. 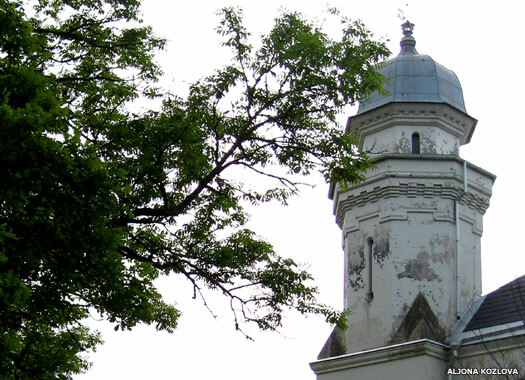 It was first mentioned in historical records in 1601, when an earlier building existed on the site. The building was presented by King Gustav II Adolph of Sweden to his secretary, Johan Adler Salvius (or Salviusele) in 1628, and was passed on to Hans Dettermann Cronmann in 1642. The manor was purchased by Otto Heinrich von Stackelberg in 1753 The von Stackelbergs served the Russian Empire - master of the Baltic States since their capture in 1710 - in positions of authority. In 1870 the manor was part of a dowry which was presented to the Swedish family of von Nolcken who, despite the Russian possession of the Baltics, were still part of the ruling elite in Estonia. The von Nolckens had served in various positions of authority over the years, including that of Swedish ambassador to Britain. The current imposing articulated castle was built in 1880-1885 in the English Neo-Gothic style by Arved Georg von Nolcken (1845-1909). He had been on a trip to Scotland where he had become fascinated with the architecture there, especially with that of Queen Victoria's beloved Balmoral Castle. 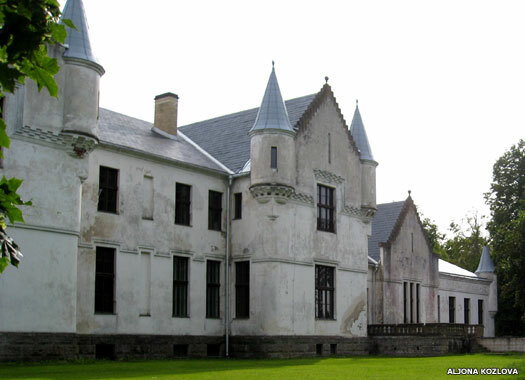 When he returned to Estonia, he made sure that the main design elements in his new castle mimicked those of Balmoral, drawing up the design himself. The single octahedral tower shown here stands on the south-eastern corner. Von Nolcken was an enthusiastic amateur architect, and his castle is slightly odd in composition. The western wing is a single-storey construction, while its opposite half has two storeys. Aside from the single octahedral tower, all other towers are rounded with sharp spires atop them. The large central section possesses a hallway or vestibule which reaches to the height of the ceiling, two storeys up, something that is a very English style of building. 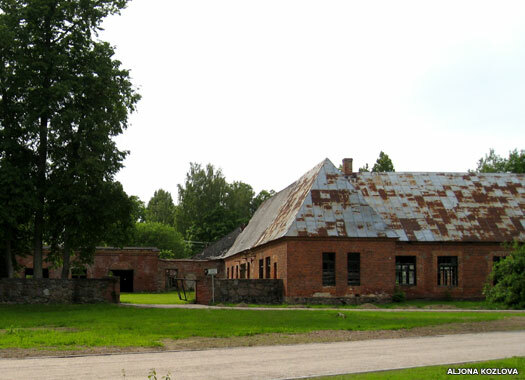 The stables shown here were rebuilt in the nineties. They form part of a spacious park which descends as terraces behind the castle building. Much of it has been preserved, including the stylish red brick gate. 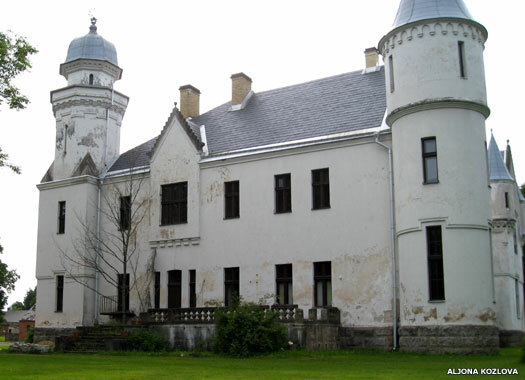 Along with all the other manors and castles in Estonia, Alatskivi Manor was nationalised upon the country's successful attainment of full independence in 1919. Since then it has been used as a school house, a border guard station (for the Lake Peipsi border), and a state farm centre. As well as building the new castle for his bride, Josephine Caroline Elise von Loewenstern, of Kuigatsi Manor in Valga County, von Nolcken also rebuilt Alatskivi church in 1866. 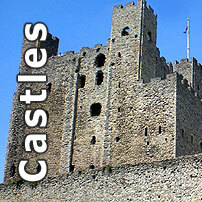 Now his castle is in the ownership of the local rural government authority. 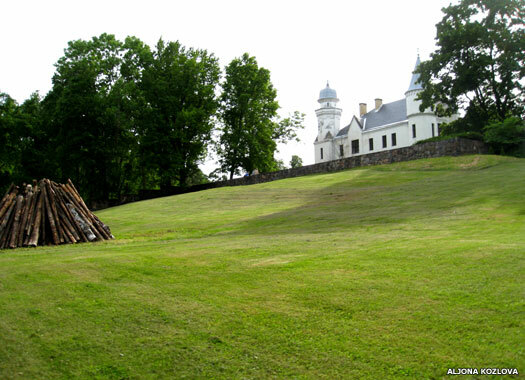 In 2009 it underwent more renovation and refurbishment work, part of a rolling programme which had already greatly improved its appearance in preparation for its opening as a museum for the Estonian poet Juhan Liiv. All photos on this page contributed by Aljona Kozlova.